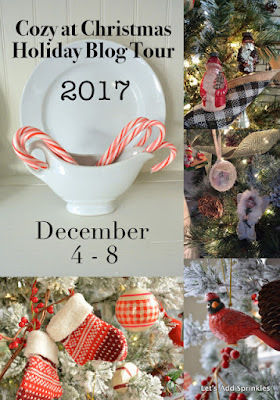 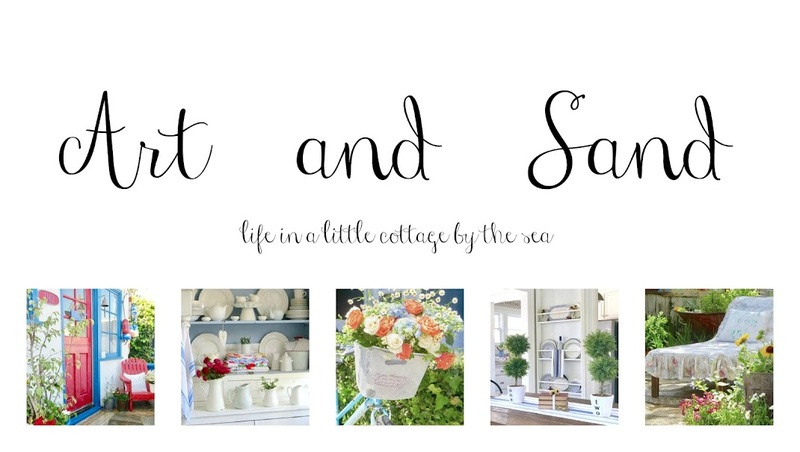 I have joined with 4 other bloggers for the annual Creating Christmas Link Party hosted by Jann of Have a Daily Cup of Mrs. Olson. 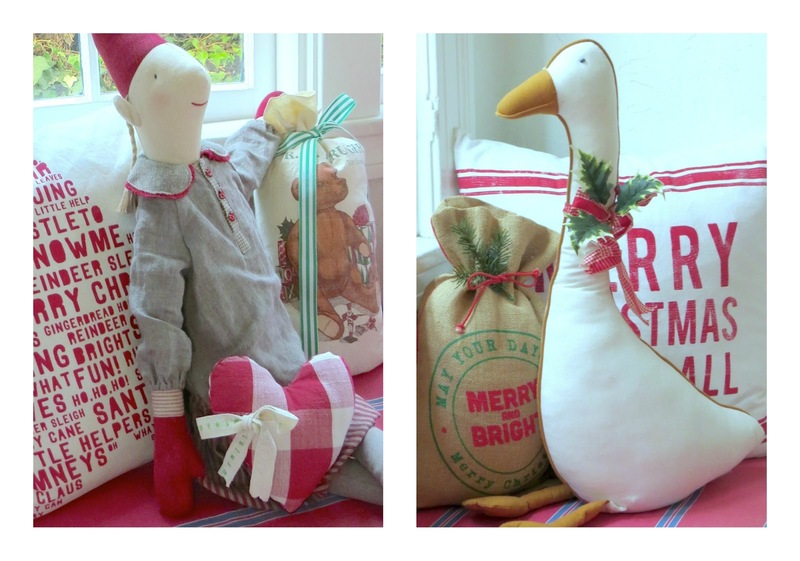 I love creating and never more so than at Christmas - this year pillows seem to be my thing. 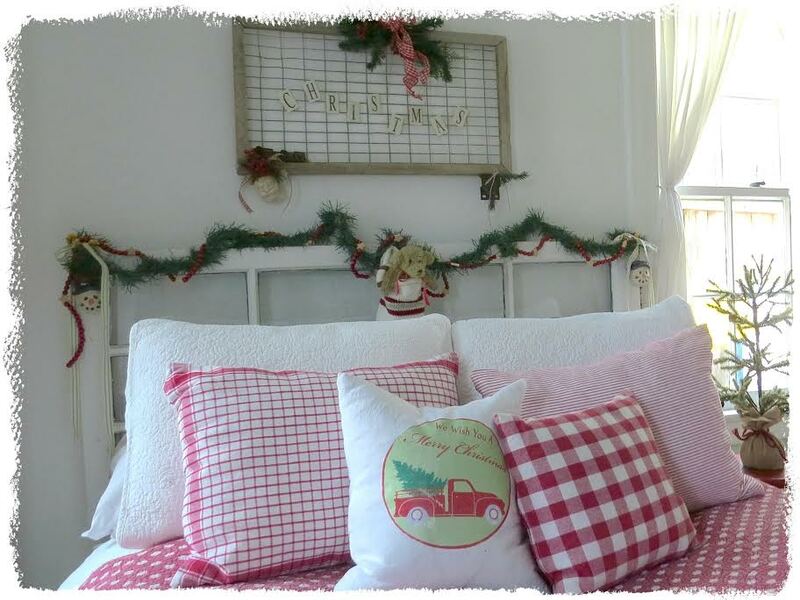 I made the little linen pillows and embroidered them in the summer on one of our long drives to and from Sacramento to see Andy. 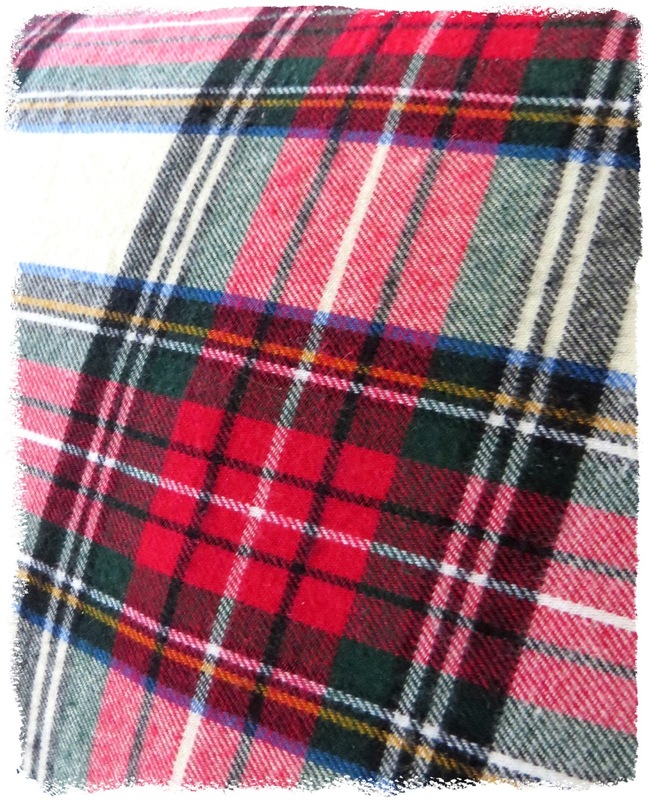 Next I jumped on the plaid bandwagon with flannel - I chose a red, white & blue fabric that will stay on the sofa through winter. I ordered a set of 8 tea towels from Bed Bath and Beyond and used 4 of them for guest room pillows. 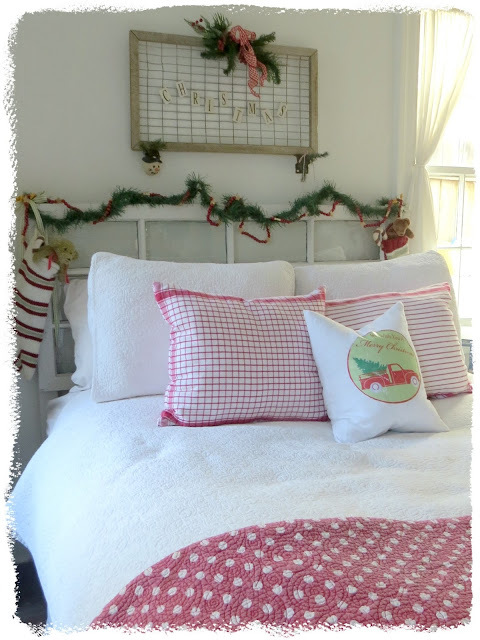 I wanted one more pillow on the bed so I created an iron on transfer with a green background to break up all the red. and this wonderful vintage Santa gift sack. 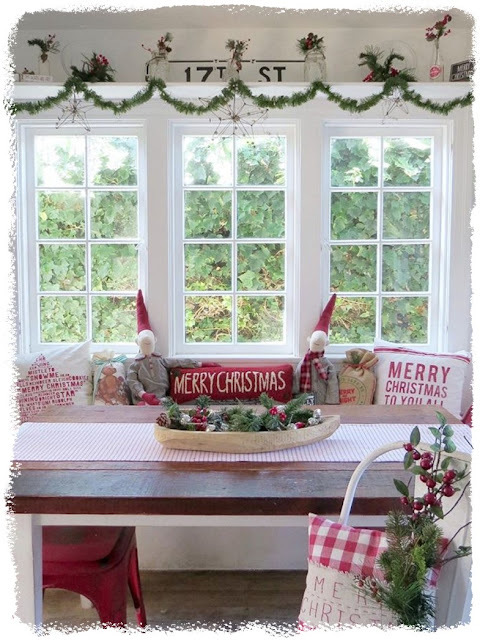 The red and white tea towel pillows ended up on the window seat in the dining room and they will probably stay right there through Valentine's Day. 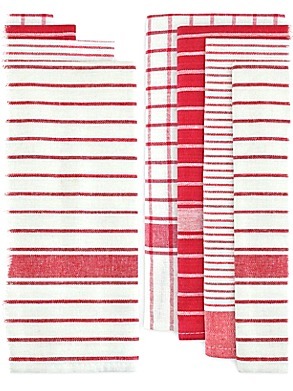 The other towels ended up in the kitchen, but woe betide anyone who actually tries to use one of the towels. Steve says, "enough with the pillows! 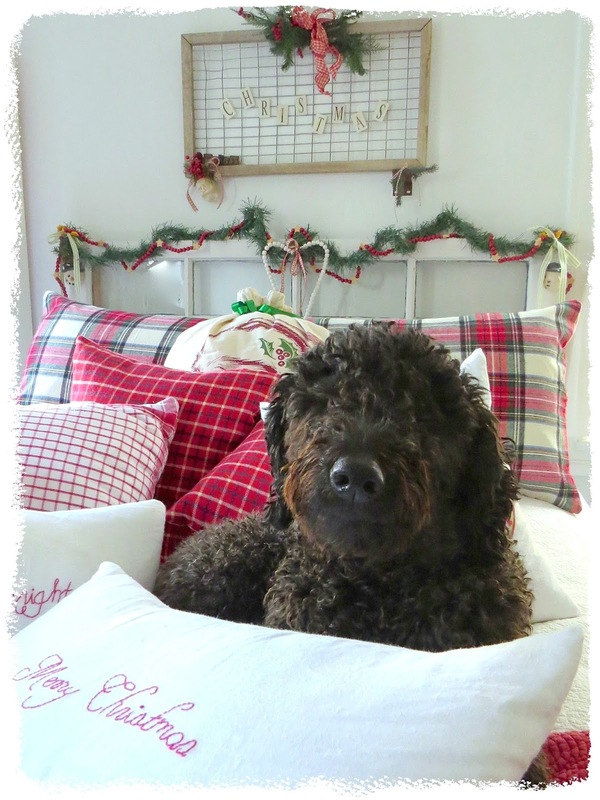 ", but Lulu thinks the more the merrier! 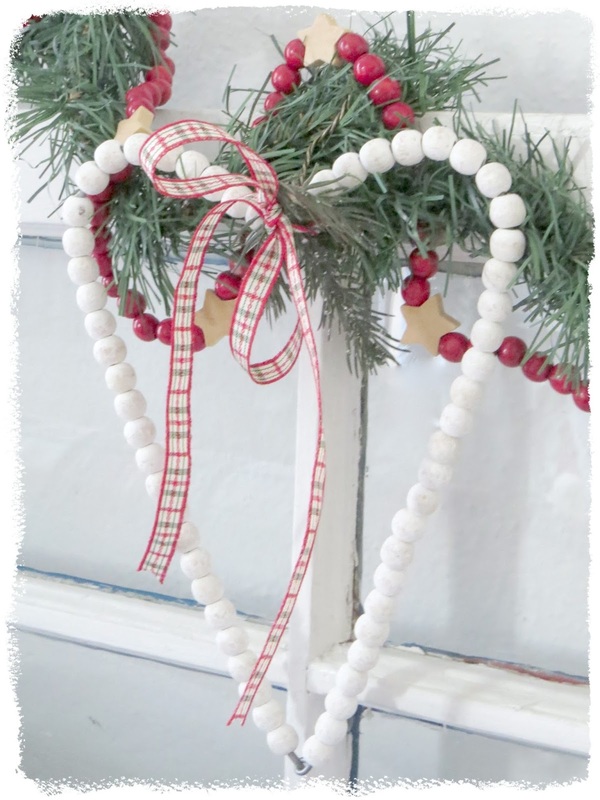 Last winter I went on a walking tour of Los Angeles Kaari and Molly Meng of French General where I found cute little red hearts and candy cane beads for a garland. The Christmas decor will disappear in a little more than 2 weeks, but the garland will easily transition to a Valentine vignette. 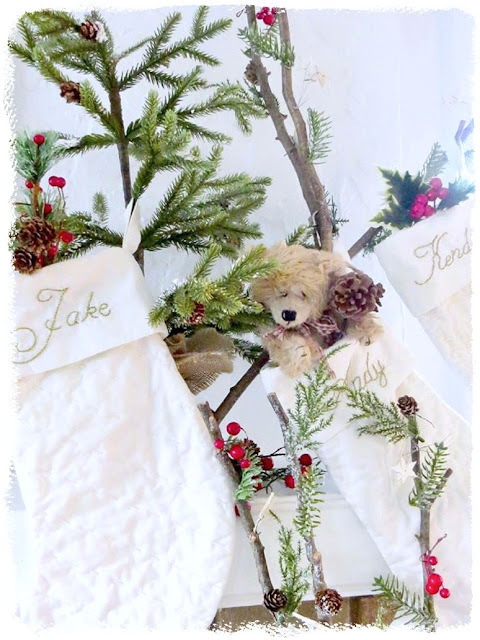 I had fun creating this MERRY and BRIGHT banner. 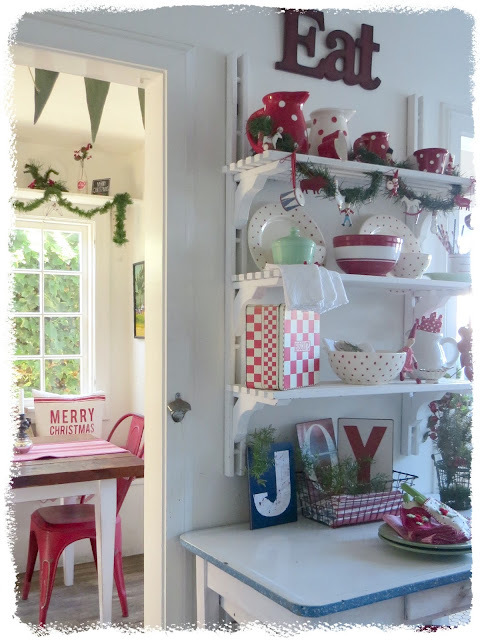 The letters are another iron-on project and you'll see from my next project that I've gone a little overboard with iron-ons this year. 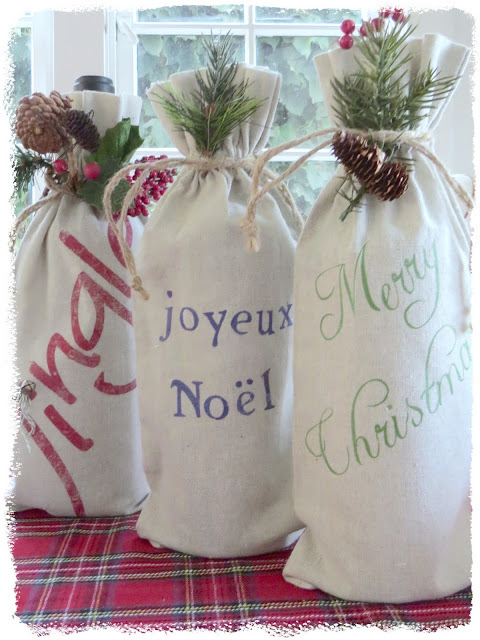 I ordered wine sacks on Amazon and made a bunch of iron-on transfers. 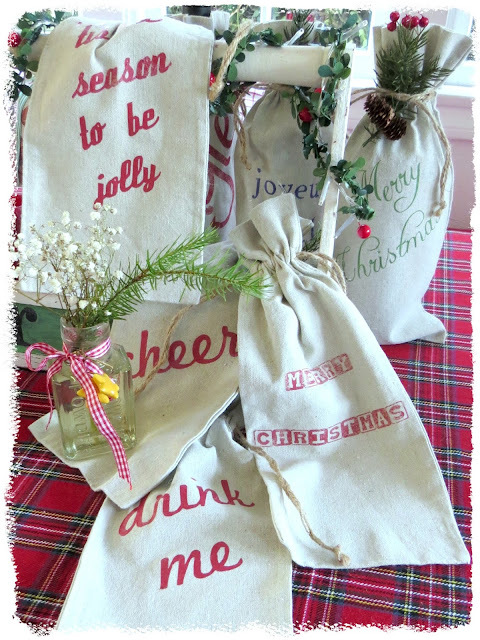 We are always popping in at holiday parties and I like having the sacks on hand to grab. 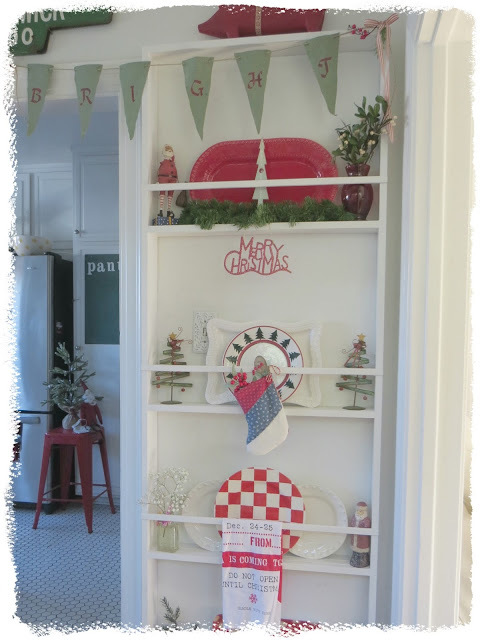 By far my favorite and worst project this year was to make stockings for KC and her family. 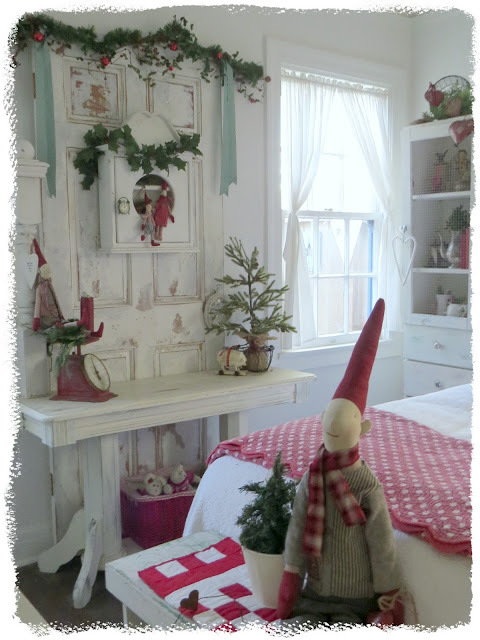 It's difficult to tell in this photo, but they are done with the pick stitch and nearly killed my hands. 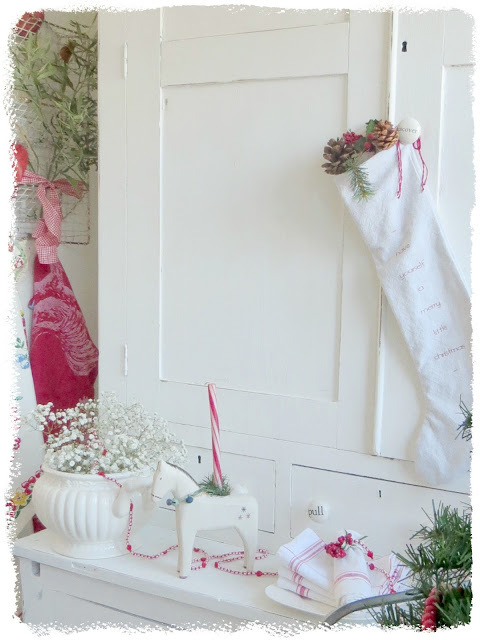 The creating time has finished and I'm spending the rest of the month having a Merry Little Christmas. And now for a bit of "A Shabby Christmas", visit Debbie Goes Shabby. 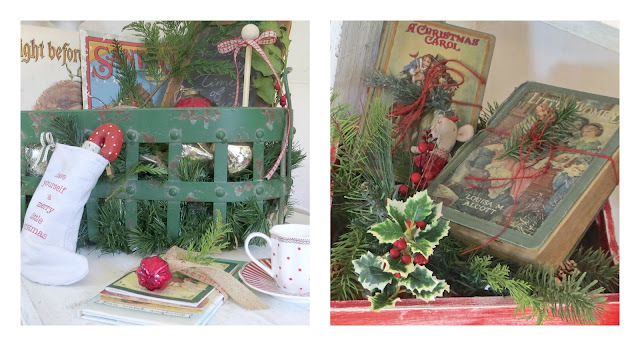 Cecilia of My Thrift Store Addiction shared "A Rustic and Romantic Christmas". 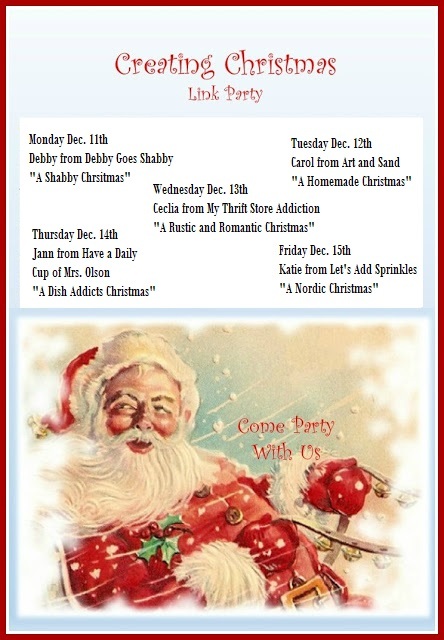 Thursday Jann of Have a Daily Cup of Mrs. Olson shared "A Dish Addict's Christmas". 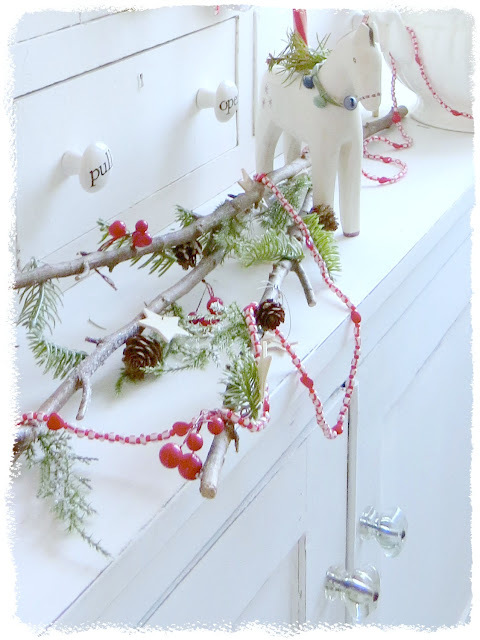 Friday Katie of Let's Add Sprinkles shared "Nordic Christmas Ideas". 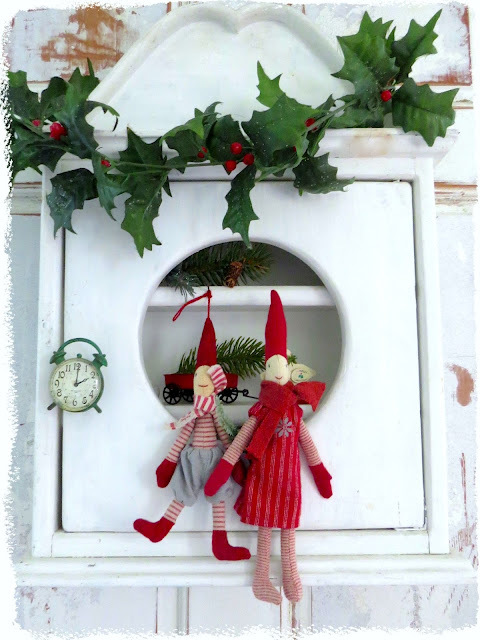 And now, it's your turn - please link up and show us what you're up to this Christmas. 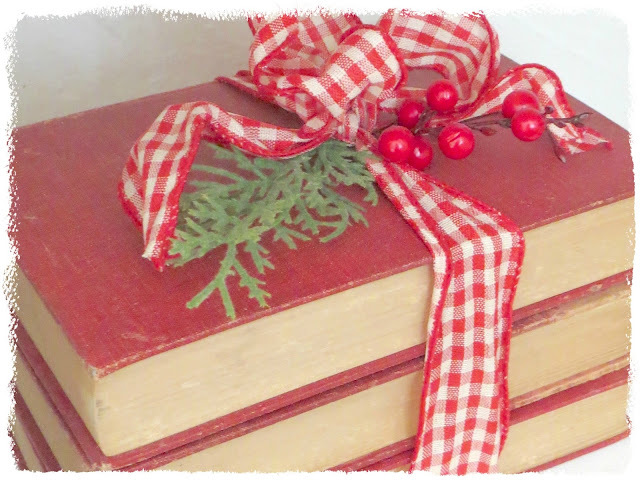 I am honored to have been asked once again to join the Cozy at Christmas Holiday Blog Tour. 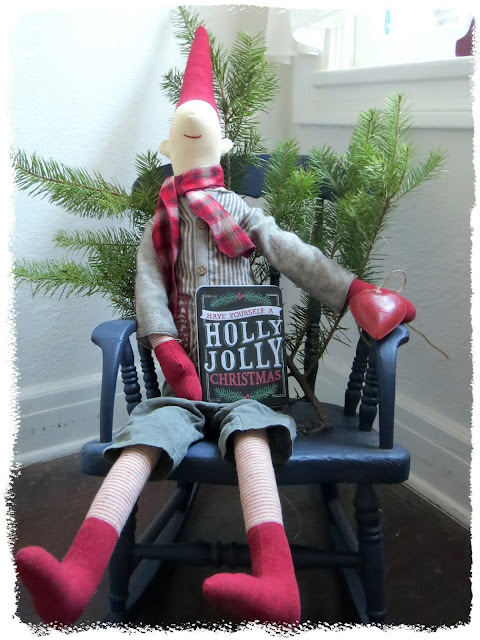 My favorite part of Christmas is seeing old friends. By old friends, I mean all the fun pieces I have amassed over the past 48 holiday seasons. but truthfully the fun of the pixies is that I only play with them one month a year. 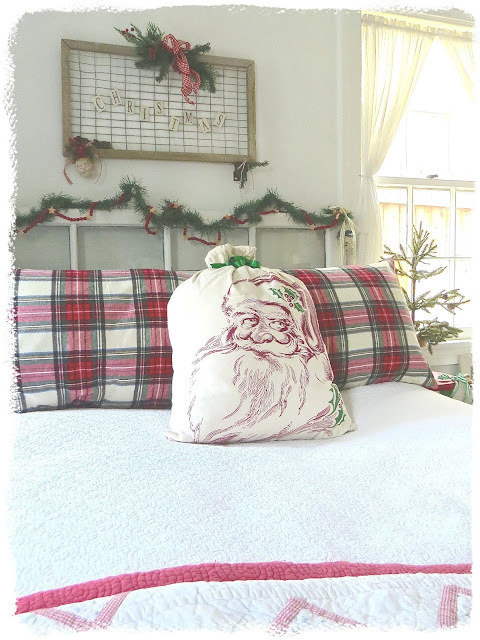 I love the gift bags (I think I have had the one on the left for about 30 years) and got the idea from Natalie of Vintage Porch to use the bags for pillows. When we downsized 20 years ago, I gave away a beloved rocking horse collection due to limited space, but I have obviously started a new collection. Both wagons have been in my collection for about 25 years, but the one on the left got a coat of green paint this year. I love using books in vignettes and these red books (vintage books from my mother-in-law) are used year round. Tattered and torn children's books along with my aunt's copy of A Christmas Carol and my mother's copy of Little Women all come out of hiding for the month of December. 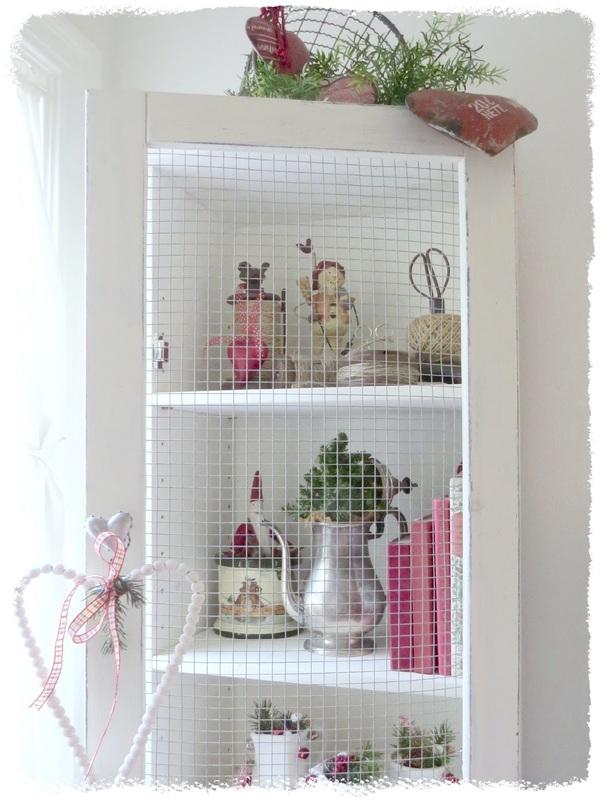 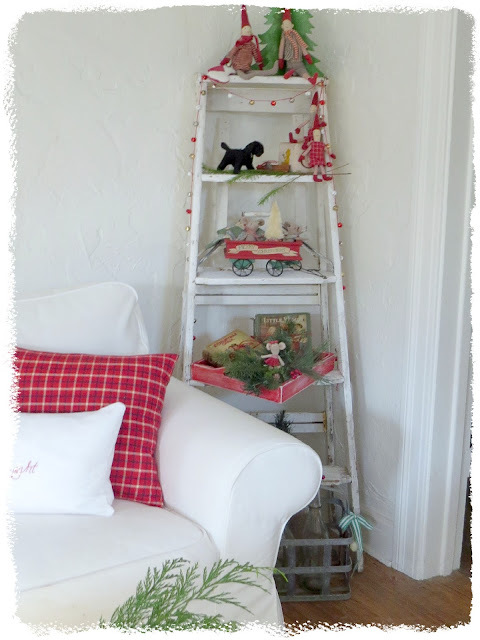 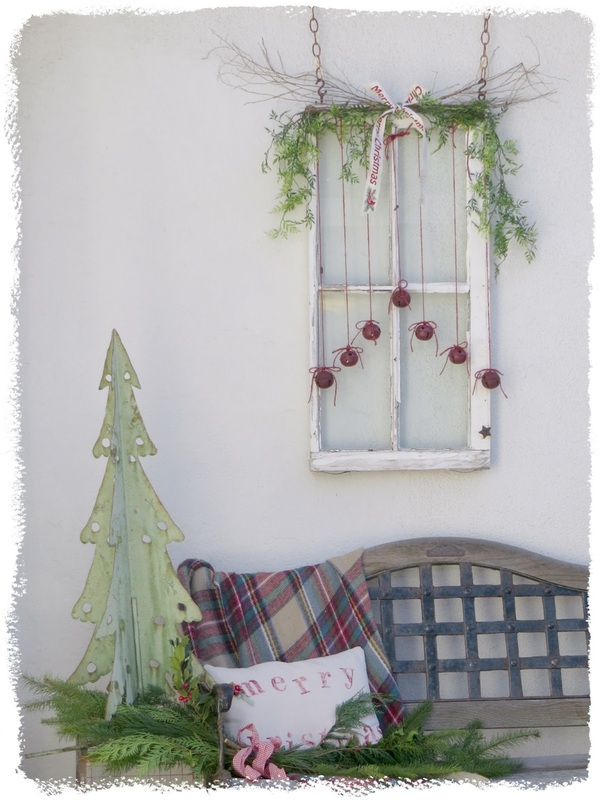 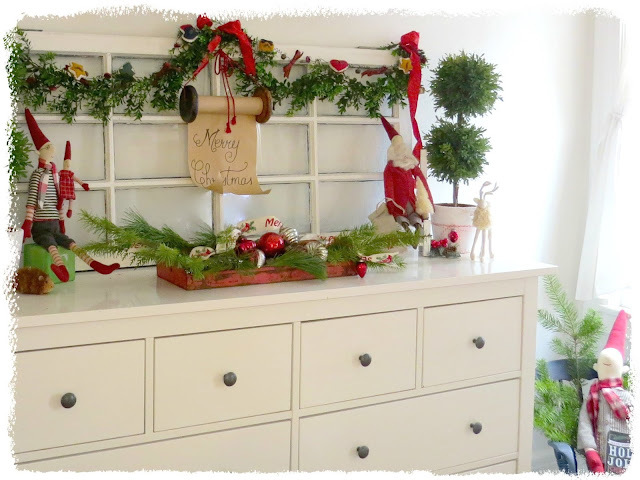 so I love having both the ladder and the tall cupboard to create Christmas vignettes. 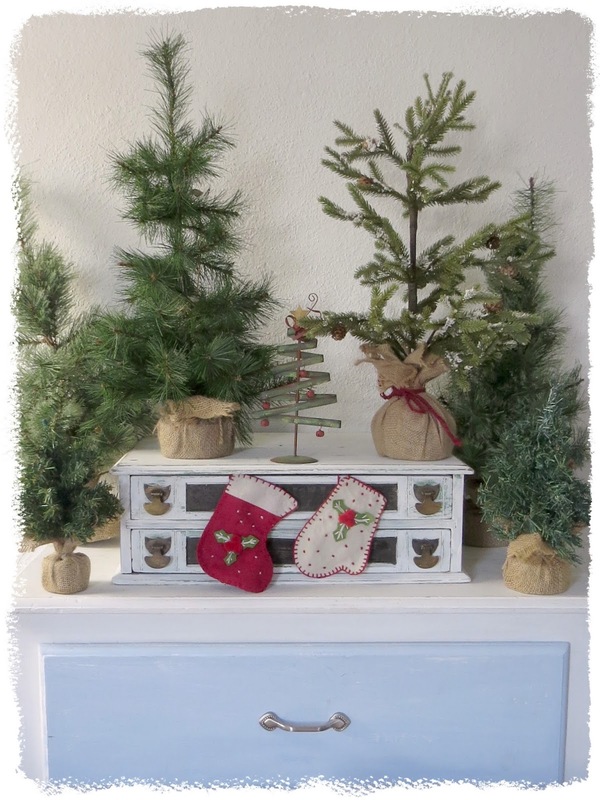 Every year I add a few new faux trees to my collection. 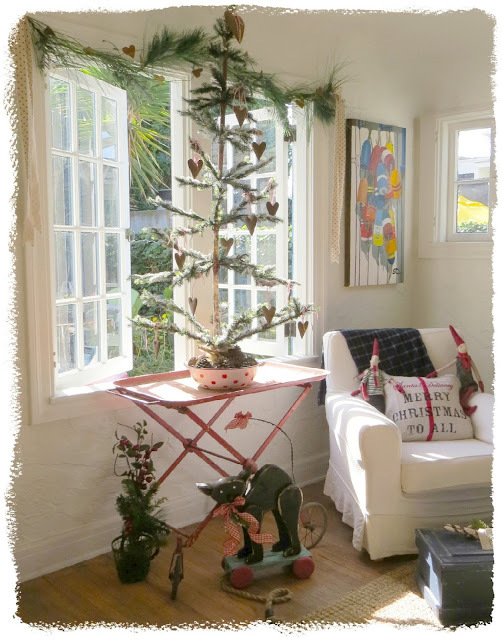 We go away for Christmas each year, but I try to have one or two real trees - I hope to keep this one growing through the year. 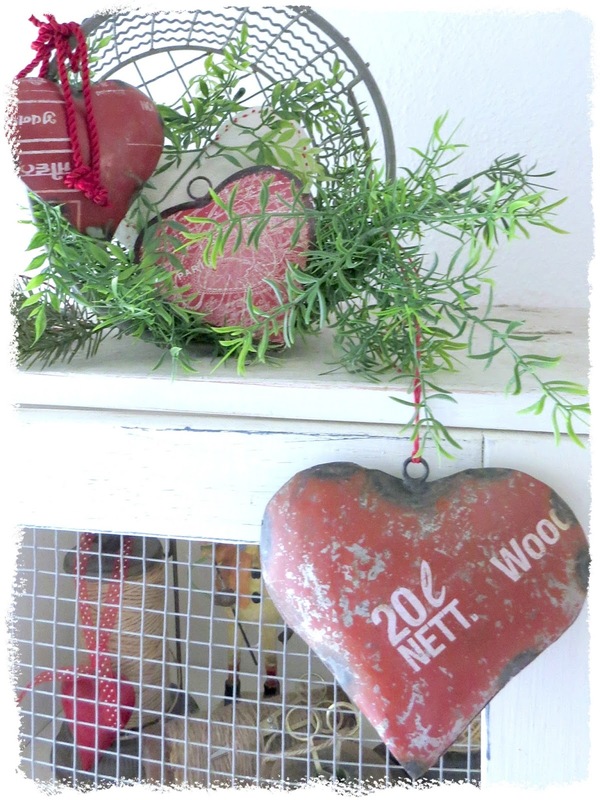 and this little rosemary tree smells wonderful in the house. New pillows in the guest room make it nice and cozy as do all new Christmas pillows in the living room. Like all my "toys", the pillows will go into hiding after making our house all comfy and cozy this December. 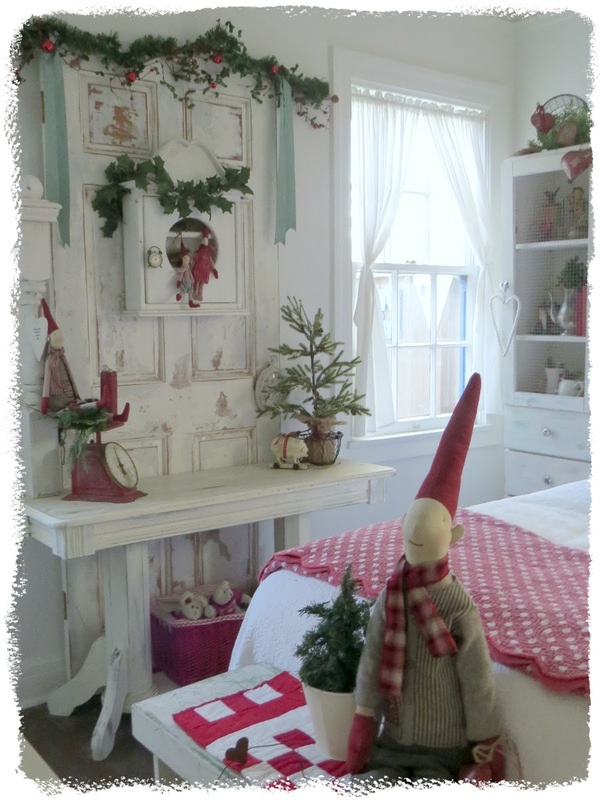 I hope you too are having a Cozy Christmas. And now it's time for you to visit all the other great Cozy at Christmas posts. 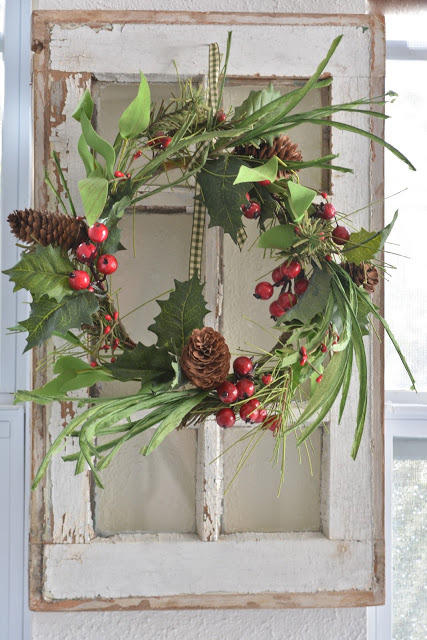 I am honored to be part of the Christmas Tour of Homes this year with 25 dynamic and creative bloggers. 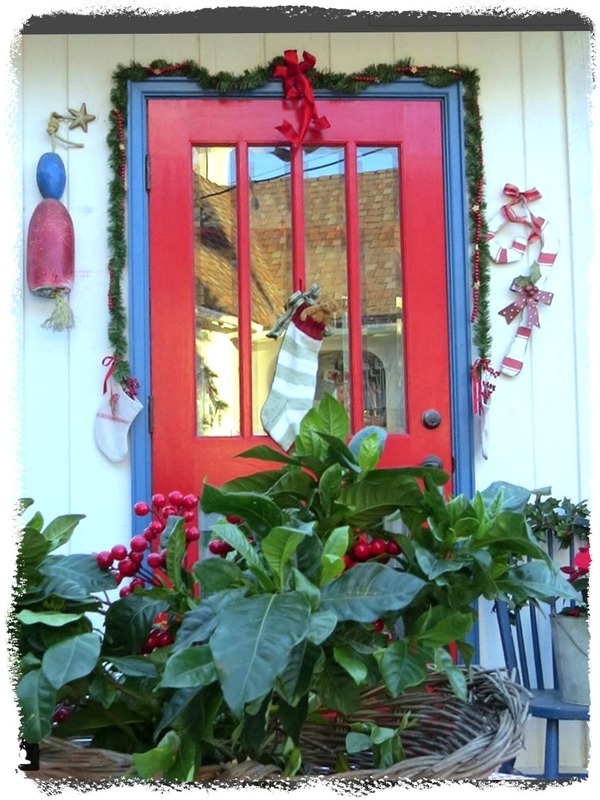 I love our house year round, but especially at Christmas. 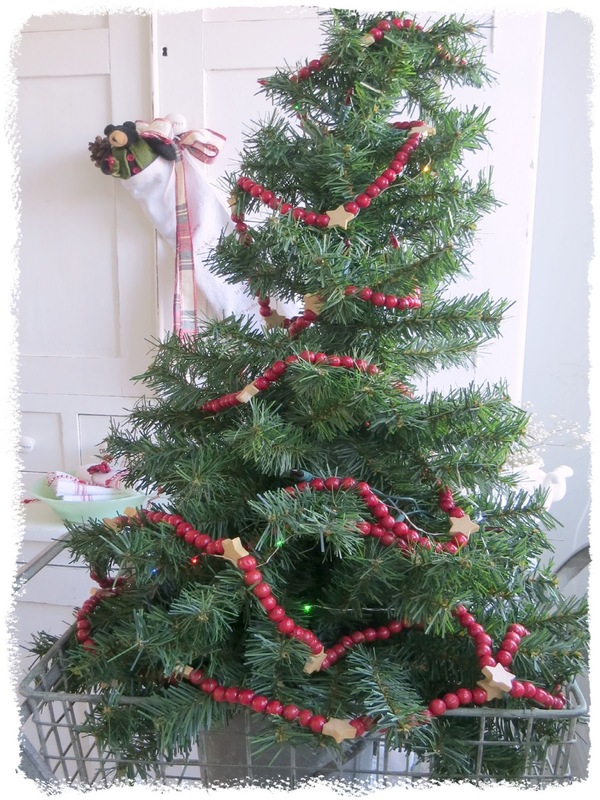 Since 2003, our tradition is to take a family vacation at Christmas so there are no real trees in the house. I bought this tree in 2003 and even after 14 years it looks fine adorned with a wooden bead garland I bought in 1987. 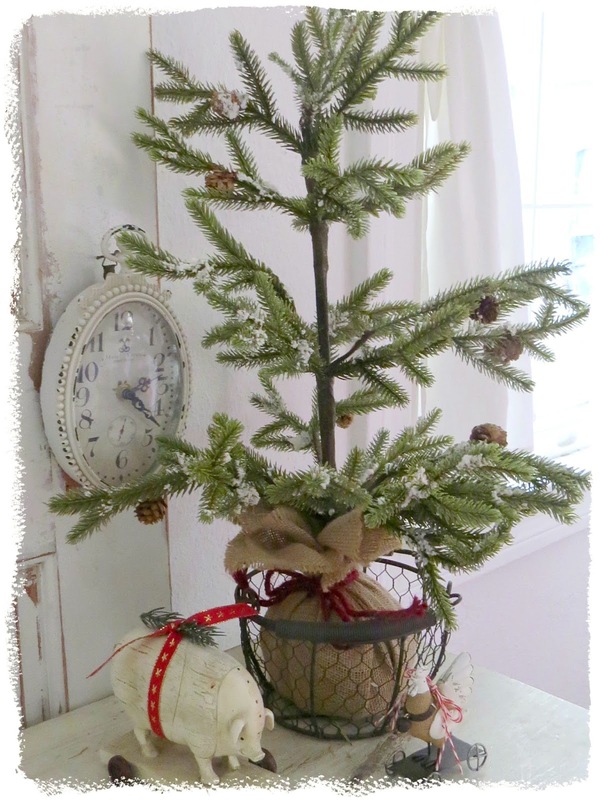 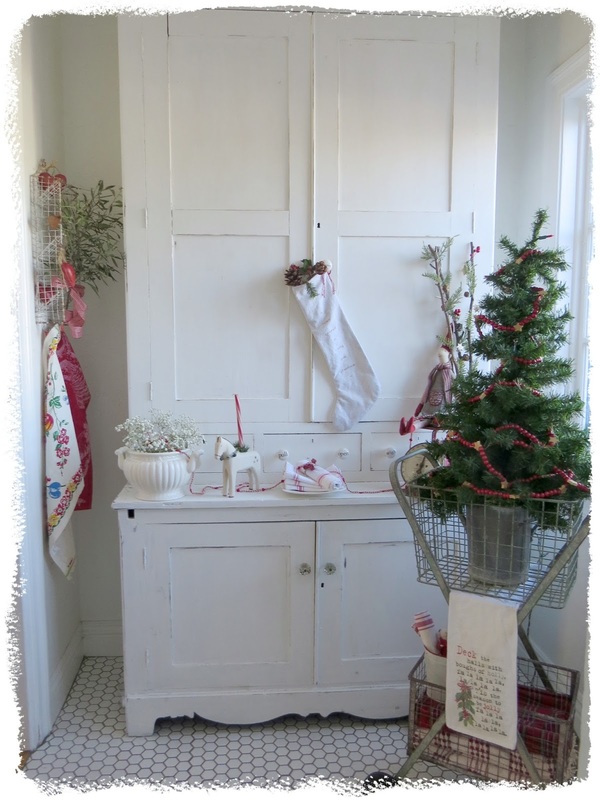 Our step back cupboard provides a nice background for the tree and the vintage look shopping cart is a fun container. 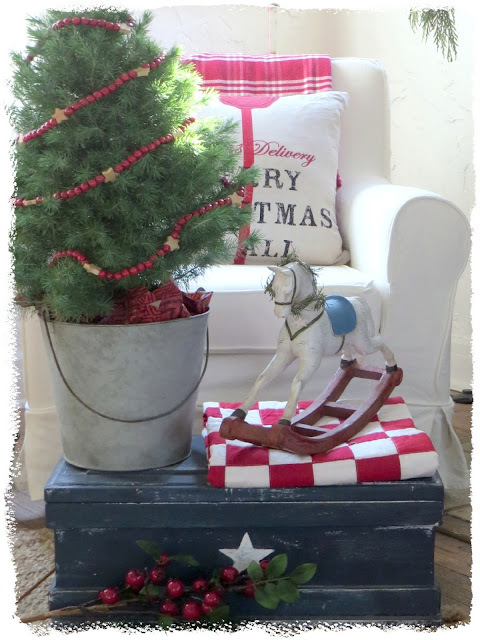 I've been purging and limiting my purchases due to the lack of space, but I couldn't pass up the cute wooden horse candlestick. 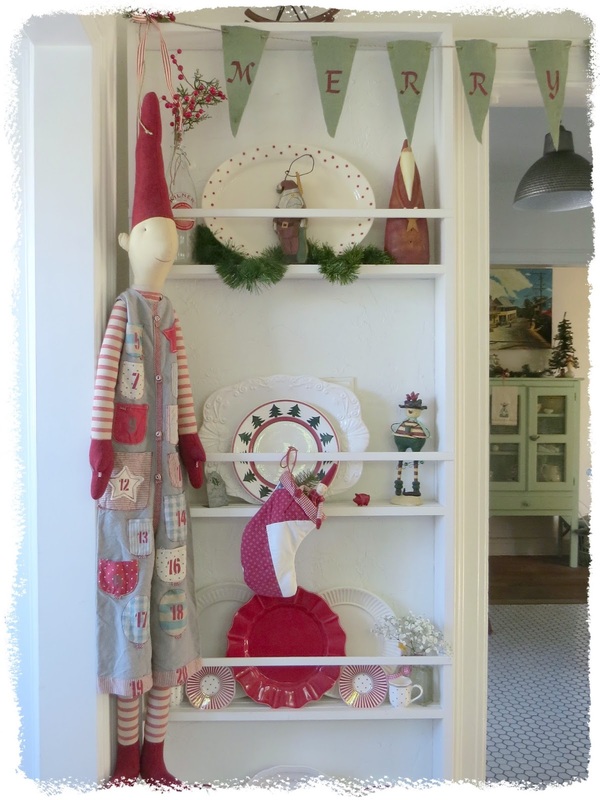 and our new plate racks are all perfect spots for both old and new treasures. 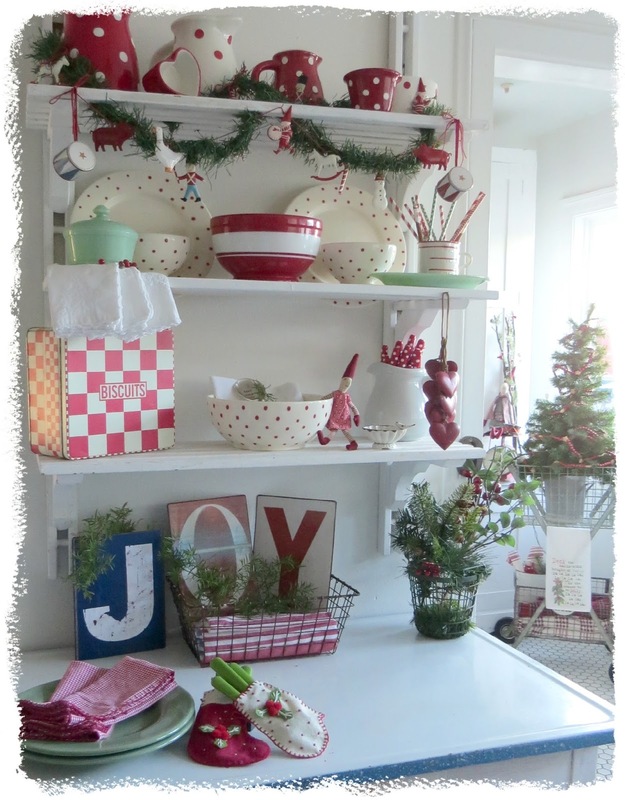 The kitchen is Steve's domain, but I get free reign on the open shelves. 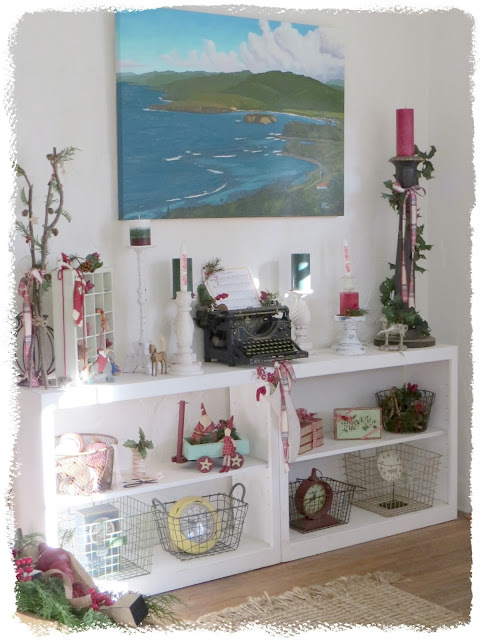 to fill up the shelves and the few bits of jadeite I received as gifts last Christmas fit right in. 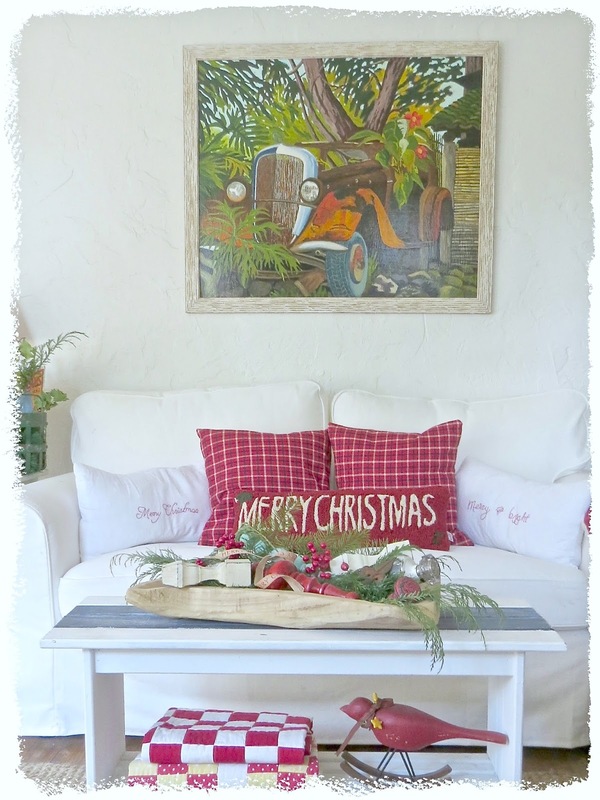 With a background of white, the living room is easy to decorate for Christmas. 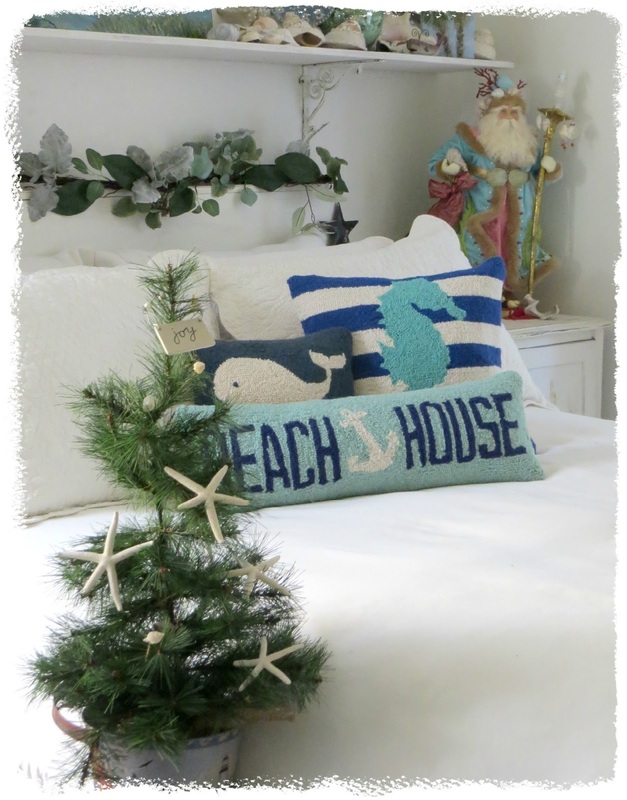 All the "beachy" decor was moved to the bedroom and a few new pillows were added to the sofa. 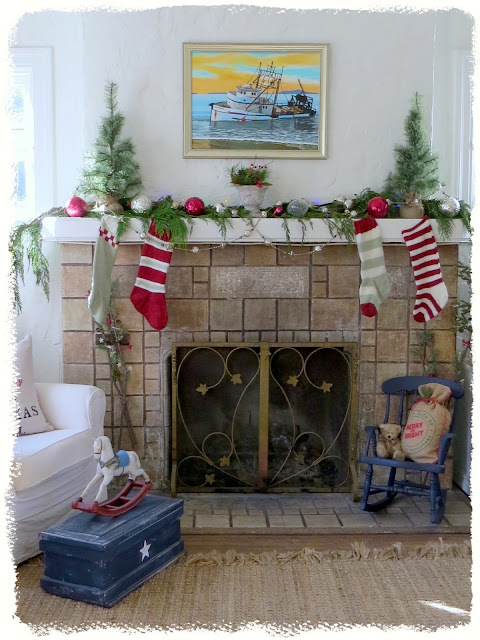 Our home is Steve's art gallery so the paintings don't change (until they sell), but Christmas trees, greenery, sparkling ornaments and of course Christmas stockings make the mantel festive. I looked for a Charlie Brown tree for over a month and finally found just what I was looking for. and it smells so good in this corner with all the different scents of the candles. 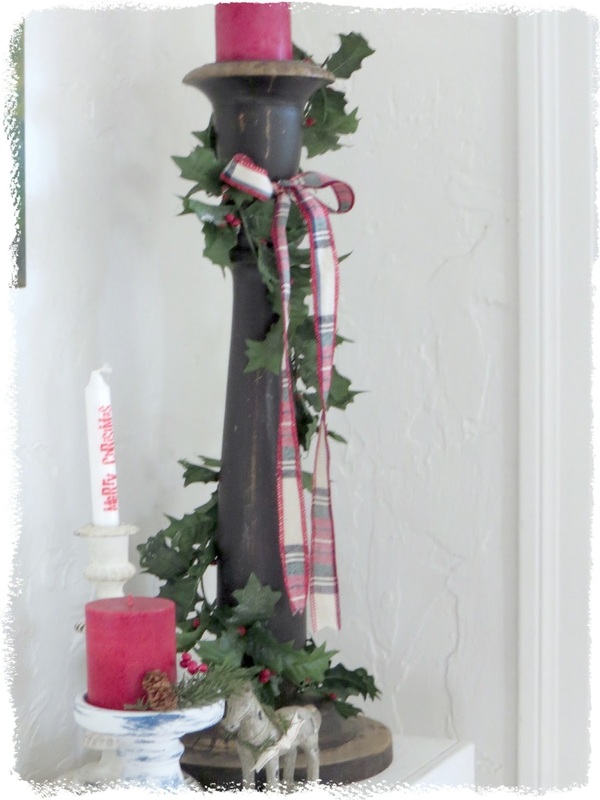 The old typewriter is one of my favorite items to decorate seasonally and this tall candlestick might be a new favorite decor piece. 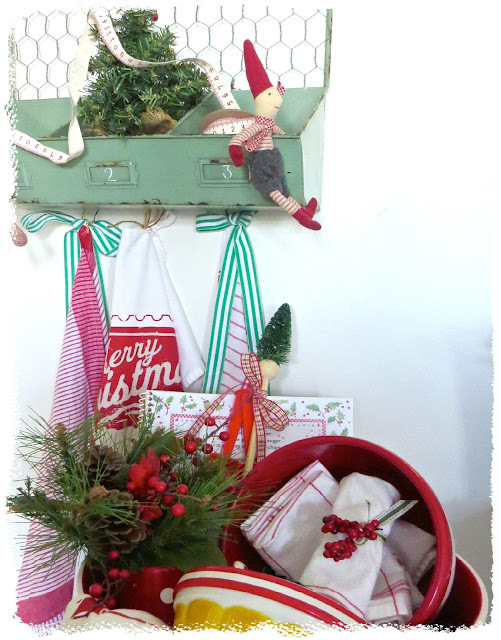 and ready for this little guy who's coming with his mommy today. 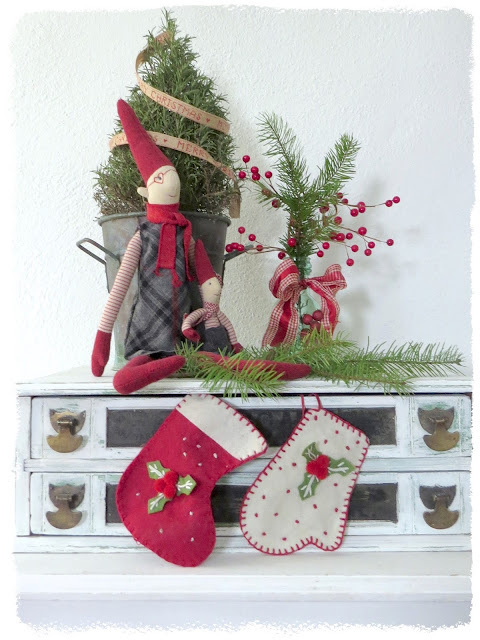 which gives me an excuse to keep adding to my collection of Maileg toys. 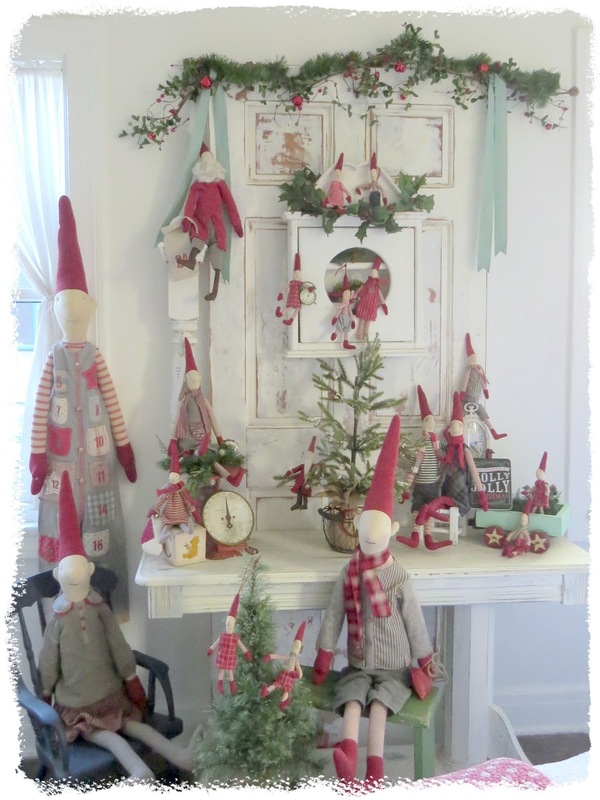 Yes, I have a bit of a problem - I blame my Scandinavian roots (grandma was born in Norway) that draw me to all the pixies. The bedroom has a nautical theme going on because my sweet daughter-in-law recently bought me fun pillows. 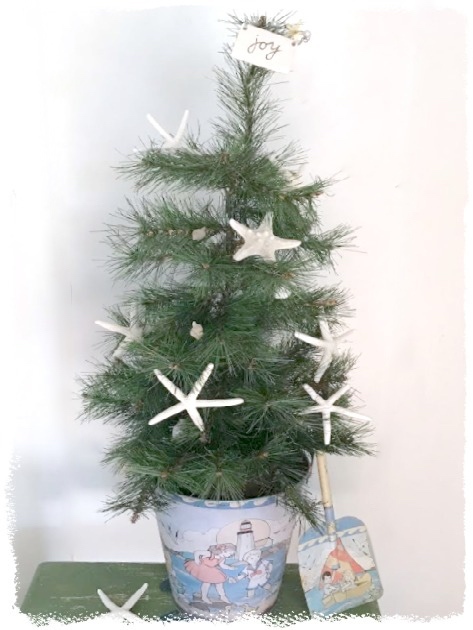 I popped a mini tree with shells and starfish into an old beach bucket. 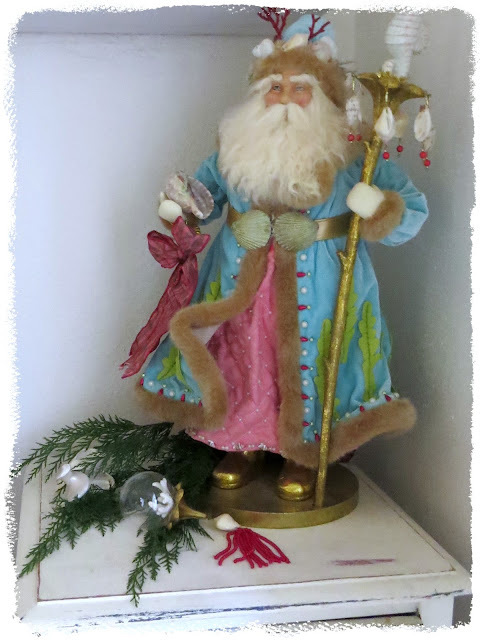 My sister has the magic touch for gifts - Neptune Santa was a gift the year we moved into our beach cottage. 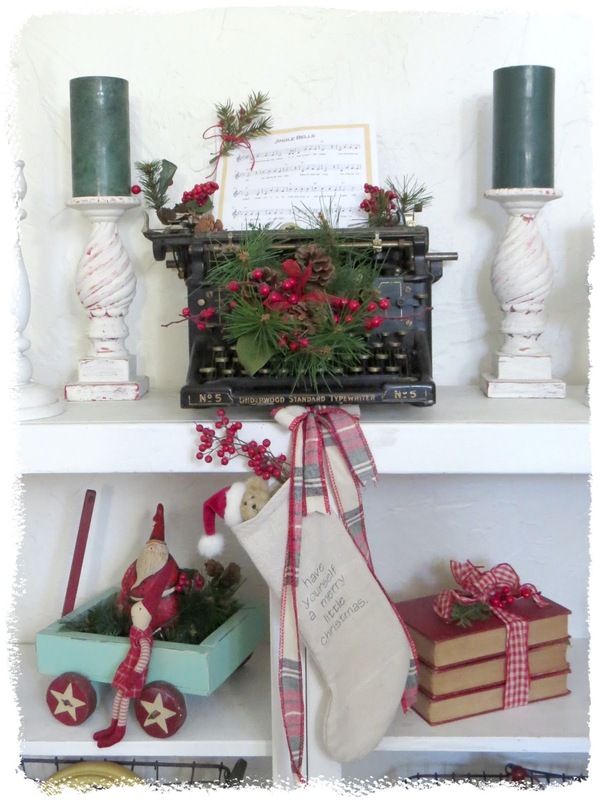 Stop by again on Friday to see my "Christmas Outside" post as part of the Cozy at Christmas blog tour. And now, on to the rest of the Christmas Tour of Homes.